As the horror of Nazism tightened its grip on Germany, Jews found themselves trapped and desperate. For many, their only hope of salvation came in the form of a small, bespectacled British man: Frank Foley. Working as a Berlin Passport Control Officer, Foley helped thousands of Jews to flee the country with visas and false passports, personally entering the camps to get Jews out, and sheltering those on the run from the Gestapo in his own apartment. Described by a Jewish leader as ‘the Pimpernel of the Jews’, Foley was an unsung hero of the Holocaust. But why is this extraordinary man virtually unknown, even in Britain? 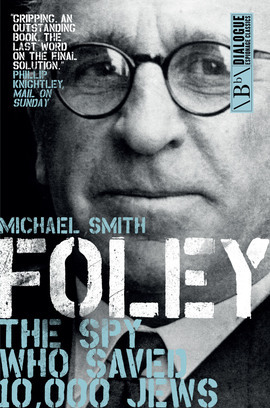 The reason is simple: Foley was MI6 head of station in Berlin, bound to secrecy by the code of his profession. Michael Smith’s work uncovering the remarkable truth led to the recognition of Frank Foley as Righteous Among Nations, the highest honour the Jewish state can bestow upon a Gentile. Foley is a story of courage and quiet heroism in the face of great evil – a reminder of the impact that one brave individual can have on the lives of many.